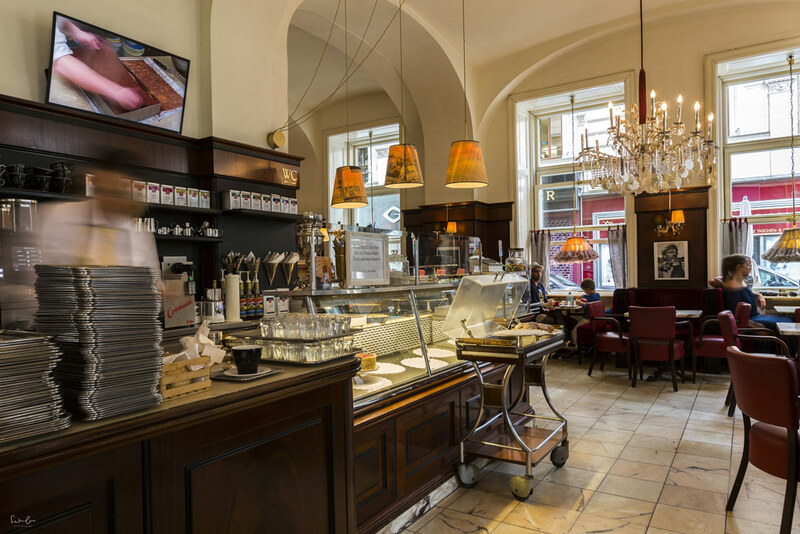 Vienna’s coffee culture has a long tradition. 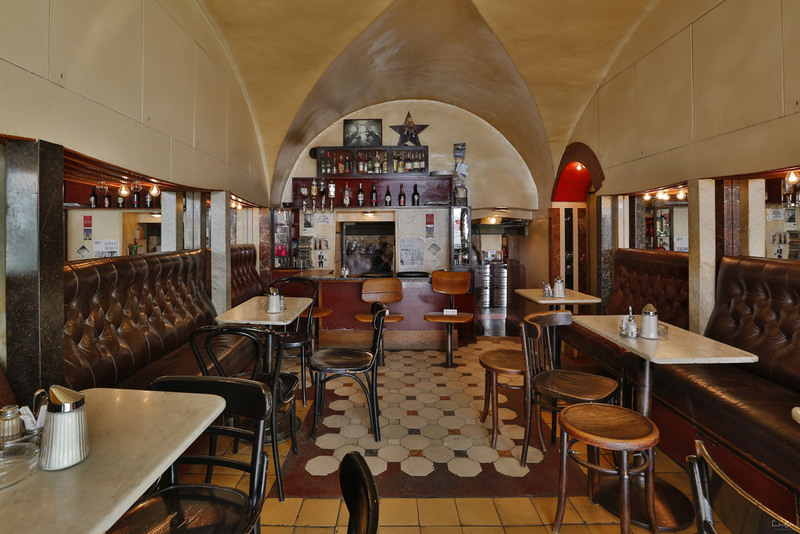 More than 300 years ago, the first coffee-house has been opened in Vienna. 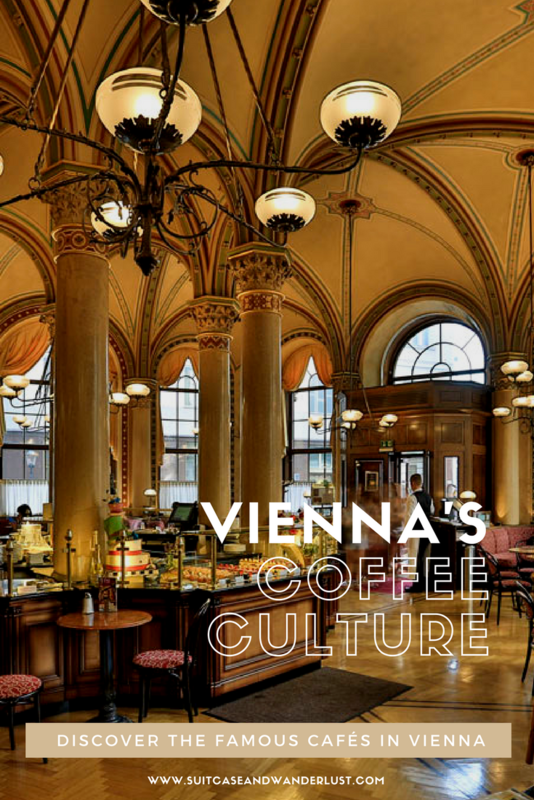 Today it is a cult, a Viennese coffee-house is an institution that no one in Vienna wants to miss – neither the locals nor the visitors. In the years around 1900, all the famous writers met in cafés to exchange with others and some of them even moved their working space there. 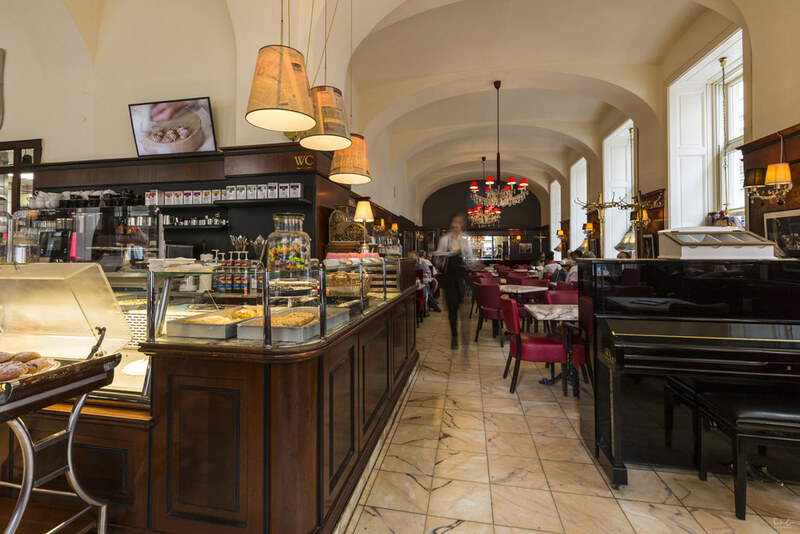 Each Vienna coffee-house has its own history and story to tell. 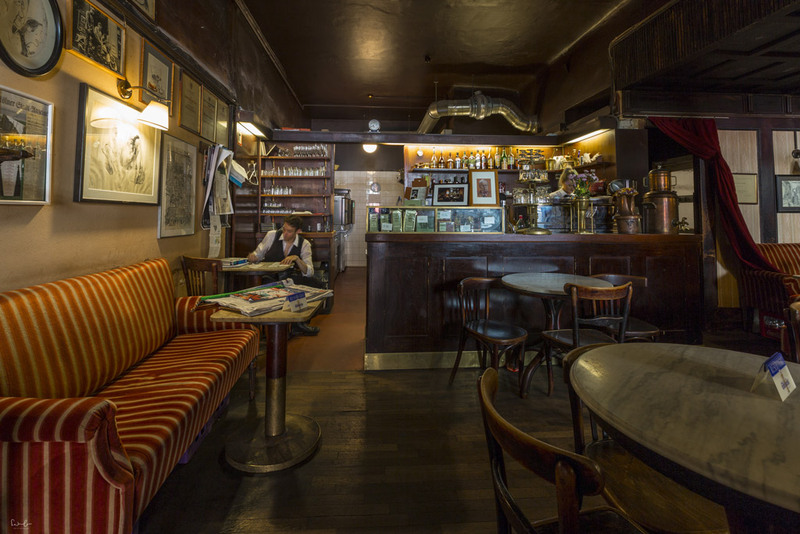 But what is so special about these old, traditional cafés? It will make you feel as you make a journey through time. Velvety seats that make you wanna sink in, the pleasant rustle of the newspapers and the lively discussions between the locals about their city and how it used to be. The magnificent and at the same time worn-out interior and the subdued light create the unique atmosphere of a living room. 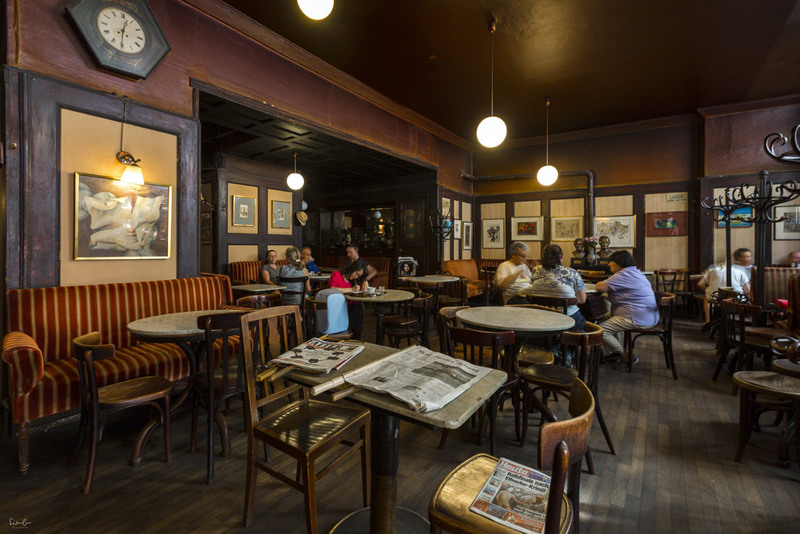 It is a place to escape from the hurly-burly of the streets where you can spend hours and hours reading the provided newspapers, socialize and enjoy a delicious coffee and a to-die-for-cake. You always get a glass of water served with the coffee. It is meant to cleanse your palate. According to an old Habsburg etiquette, the spoon is put face down on top of the glass showing that the glass has been filled up freshly. Opened in 1876 it was the meeting point of Sigmund Freud, Stefan Zweig, Peter Altenberg and Adolf Loos. The most famous writers, architects, revolutionaries and thinkers used to meet for a coffee, a cigar or a game of chess in Café Central, in the heart of Vienna. Peter Altenberg’s mail address was Café Central, he even got his laundry be delivered there. Rumors are saying, he’s still owning the bill. 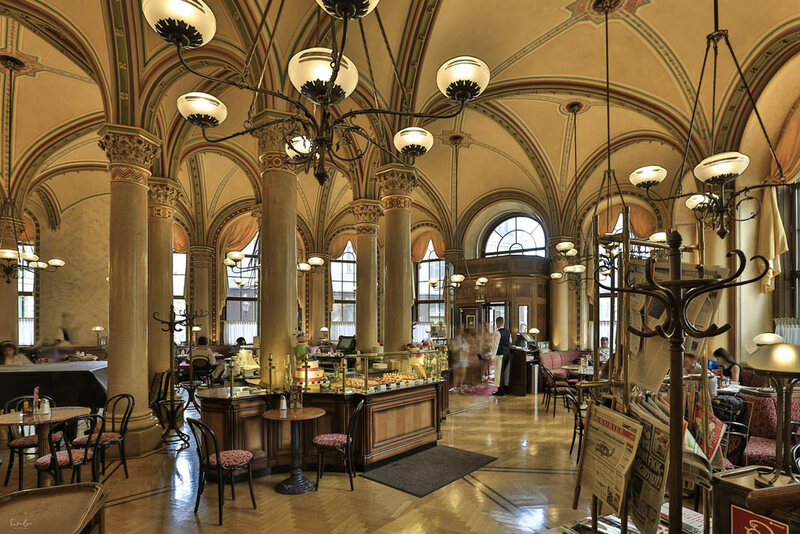 Today Café Central is an icon of the Viennese coffee-house culture. It combines a fascinating architecture with a huge variety of dishes and pastries. 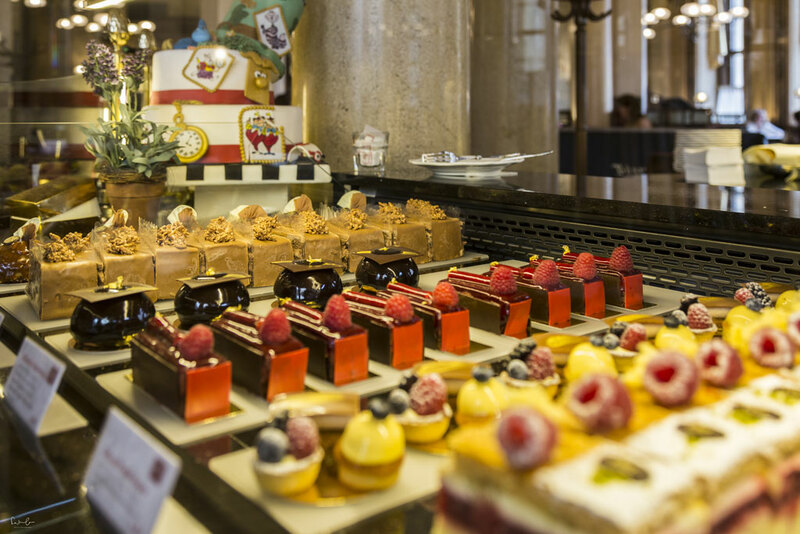 It might take you a while to decide on which cake you’re going to order if you stand in front of the glass cabinet showcasing all the delicacy. I’ve chosen the „Schokozauber“ – heaven for pastry lovers. The service at Café Central is excellent and the waiters are very friendly. The busiest time, by the way, is at around 5 pm when the piano player starts his performance. You might even have to queue outside to get a table. But I promise the waiting time is worth it. 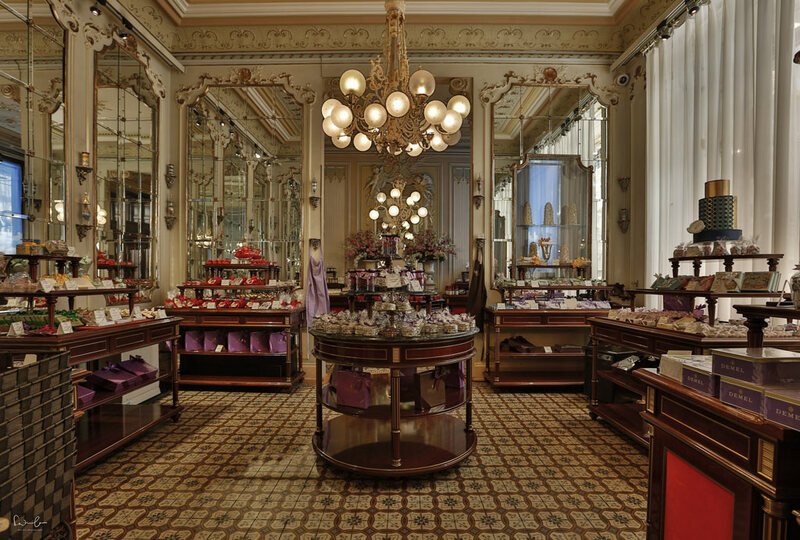 In 1888 the Demel brothers opened their k.u.k. (by appointment to the imperial and royal) confectionary at the current address Kohlmarkt 14 and was the meeting point of the aristocracy and bourgeois. 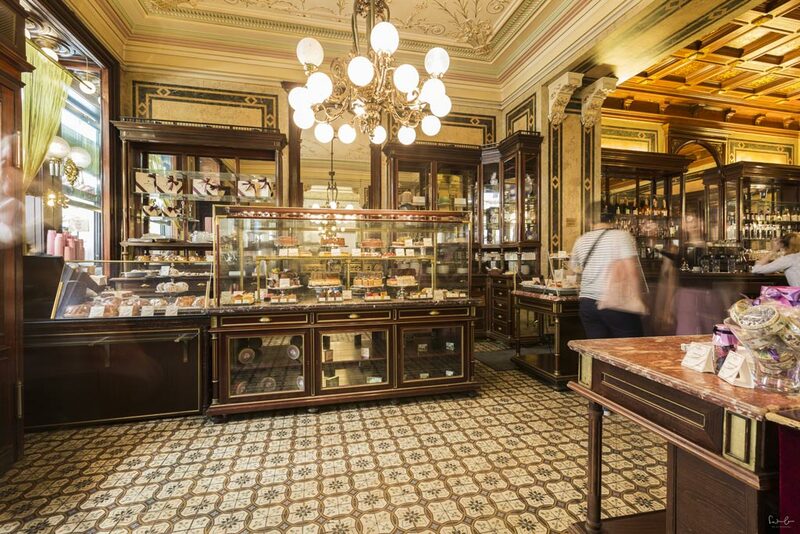 Today you’ve got a lovely gift shop where you can buy sweet traditional souvenirs for your beloved ones at home and enjoy a Viennese coffee in the coffee area in the back or first floor. On the way up to the first floor, you can have a sneak peek in the confectionary watching the patissiers creating their sweet pieces of art. As if by miracle, the café remained undamaged when Mr. Hawelka returned from second world war and reopened the place with his wife Josefine. 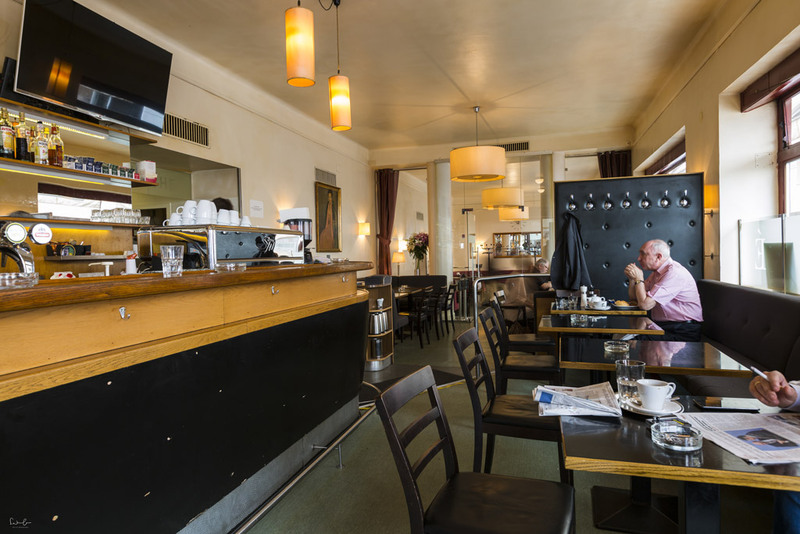 Young artists, writers and intellectuals discover Café Hawelka as their meeting spot. 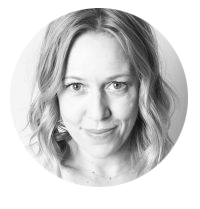 Politicians and journalists from everywhere came to discuss the latest trends. Not only can you soak up the unique Hawelka atmosphere, but also enjoy their own coffee from the Hawelka roasting facility. The loud and sometimes gruff tone of the waiters is part of the place, do not take it personally! Good things come in small packages. This quote applies to this little, captivating café on the scenic Franziskaner Platz, a bit hidden, but in the city center. The café’s tradition has not been that long compared to some of the others, the stories this charming little beauty has to tell can compete though. 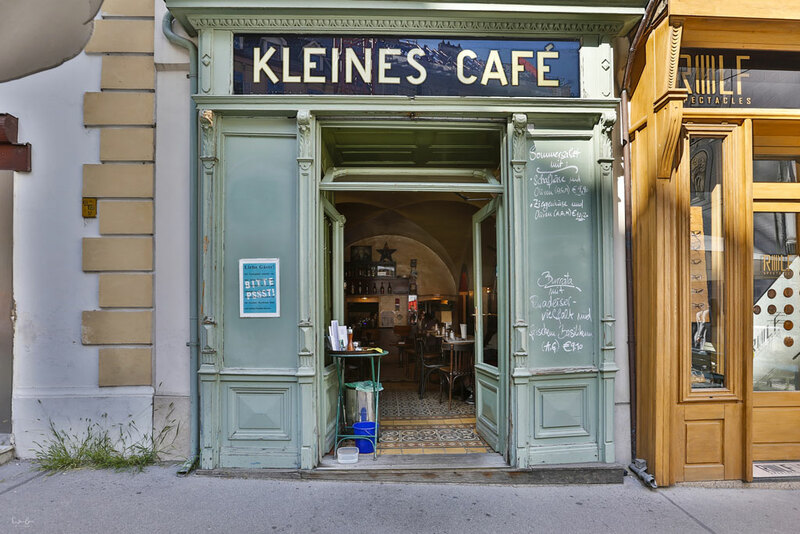 Hanno Pöschl, a born-and-bred Viennese gastronome, and actor opened the Kleines Café (“Kleines” means small) in 1976 when he was an actor in numerous films, series and theater plays. One scene in Before Sunrise with Ethan Hawke and Julie Delpy was shot in the Kleines Café and Hanno played the arguing husband in the train right in the beginning of the movie. I had the most interesting afternoon when I visited the café for the shooting. The famous owner was there himself and he didn’t let me go without having a real Mokka with him. At the end, I spent three and a half hours there listening to his stories from the café and how he started his career as an actor and got discovered for roles in international movies. Try the Wiener Wurstsalat (salad made of sausage, onions, tomato with vinegar and oil). It’s probably the best you’ll find in the city. 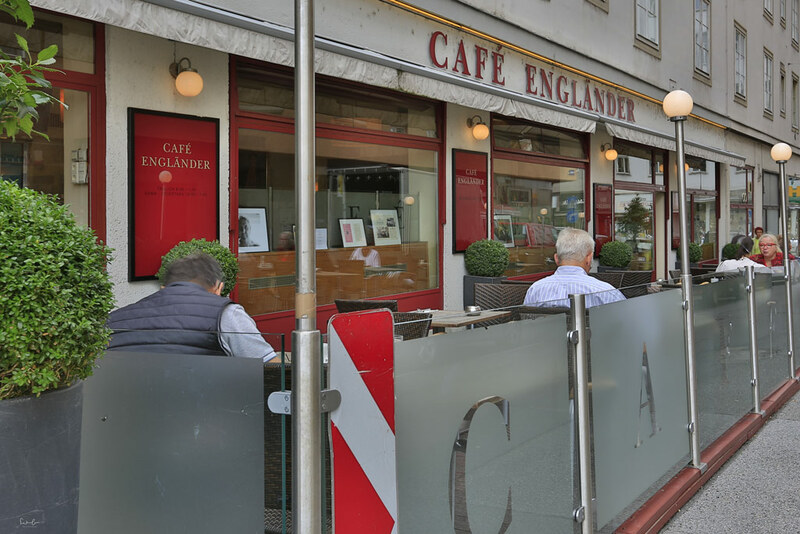 Café Engländer is not only a coffee-house but one of the best taverns with amazing Viennese food. There’s a quiet non-smoking area in the back or the busy, smoking area part in the front with the bar where the local prominence meets for a glass of wine, demand long discussions and watch the sports channel. It’s a place to meet from morning to late evening. You can get a wonderful breakfast, a little menu for lunch, a great diner and drinks at the bar. I usually can’t decide whether to take the Wiener Schnitzel or the Beef Tartare. Preferably both. Since 1875 Diglas is well-known as one of the traditional coffee-houses. Emperor Franz Joseph I. paid a visit at the opening of one of Mr. Diglas’ restaurants in Vienna. The composer Franz Lehar or poet Heimito von Doderer used to be one of the regulars in the café in Vienna’s first district. It’s interior is classic traditional with artistic black and white photographs. The piano player starts every day at 6 pm. 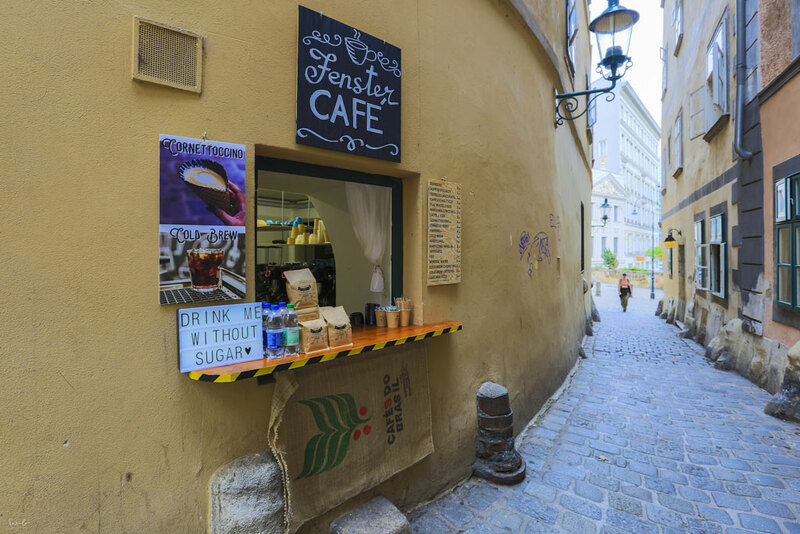 It is not one of the traditional cafés, but the idea of it is so nice, that I decided to put it up in the list of Vienna’s must-visit coffee spots. Third wave coffee, Cornettoccino or Macchiato sold through a window (in German Fenster, therefore the name Fenster Café) in the picturesque little street Griechengasse. You can take your coffee to go or stay by the window and have a chat with the owner about coffee. Opened daily from 9 am to 5 pm.